I have been waiting to check out Joe Beef for some time now. And when I wait for that long, there’s usually doubt that lingers in the back of my head filling in the gap between expectation and reality. What if I have simply hyped up the restaurant in my own head? What if I end up sorely disappointed in what I find when I finally step inside the doors? What if the service is off putting and the food not that exciting? Luckily, these all dissipated the second I found my seat at the bar of Joe Beef, a world famous neighborhood spot. Honestly, walking by the restaurant, you would never know how much of an international sensation Joe Beef has become. It took me a while to absorb the feel of the humble Little Burgundy neighborhood which was quite far away from the busy old town area of Montreal. 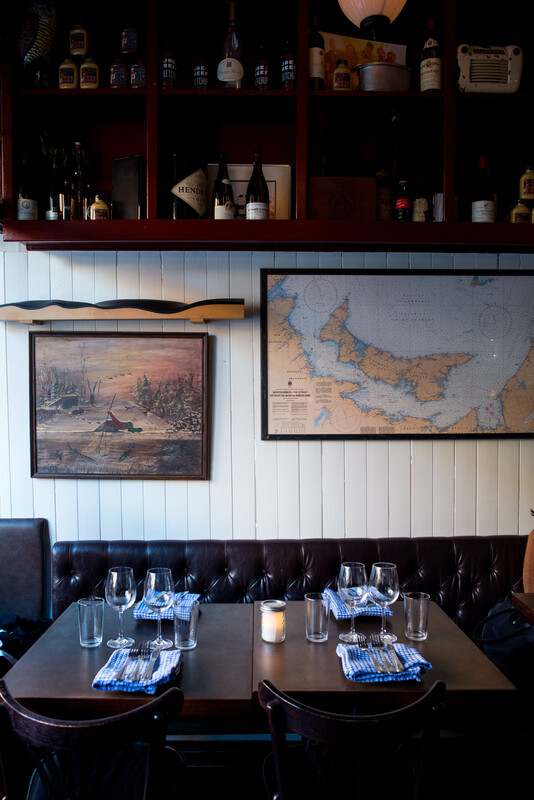 That down to earth feel carried through into the restaurant, from the cozy decor to the chalkboard written menu that changes daily to the affable bartender who treated us like regulars. Even though the dining room was starting to fill out when we sat down, we felt like we had the whole restaurant to ourselves. The bartender patiently explained everything from the French menu to us, carefully describing every last ingredient and preparation. 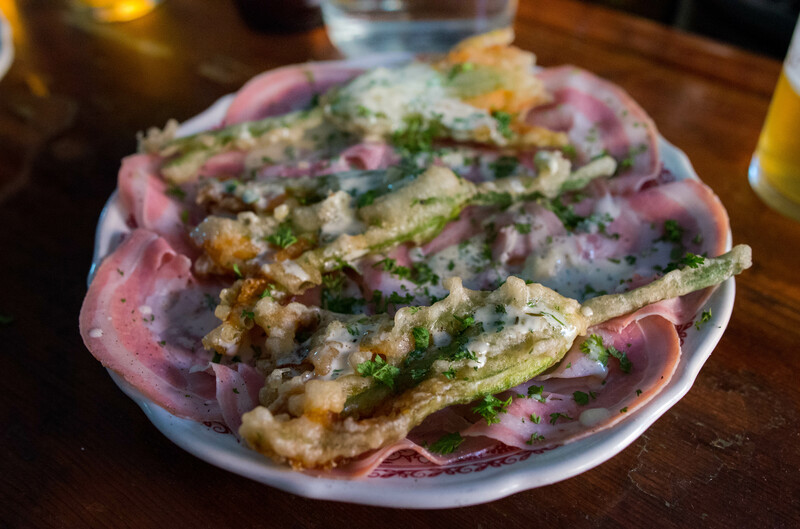 We were drooling before he even made it to the end and since we had to start somewhere, the unbelievably light fried zucchini flower with tender jamon de veau seemed like a pretty good place. 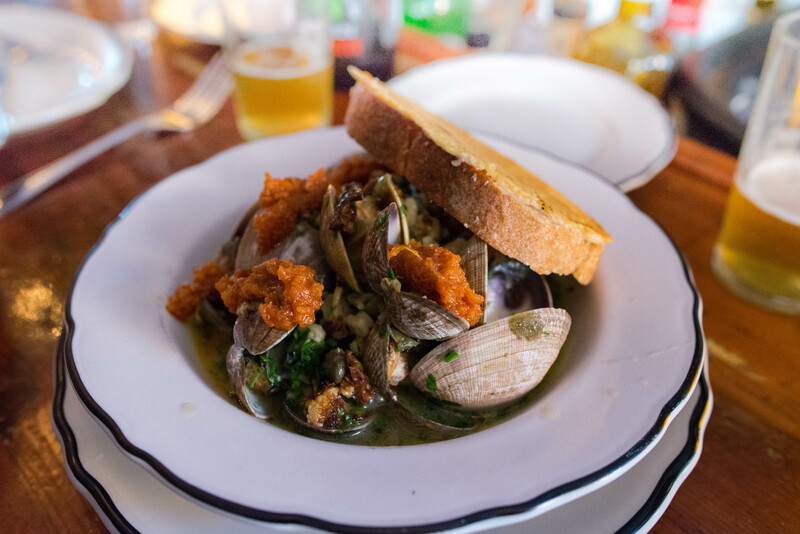 We moved onto a plate of steamed clams and sausages that tasted of flavorful ocean. 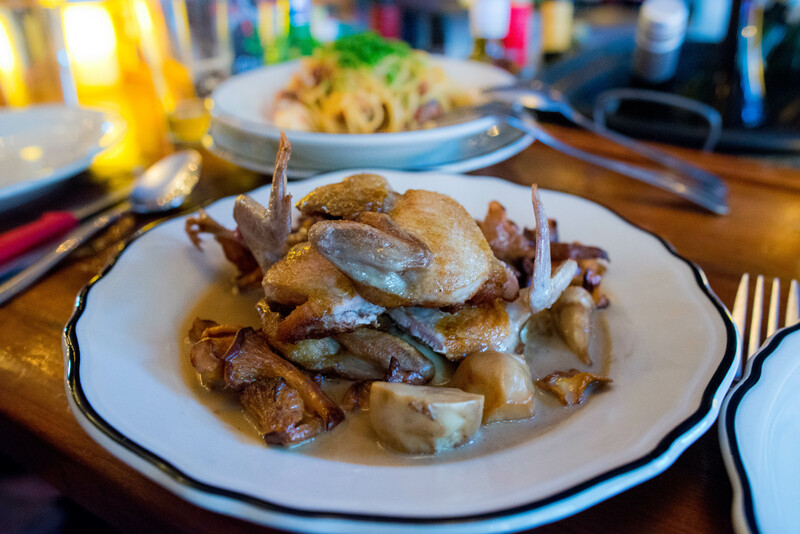 And then the rich plate of seared quail balanced over some of the most decadent mound of mushroom medley. 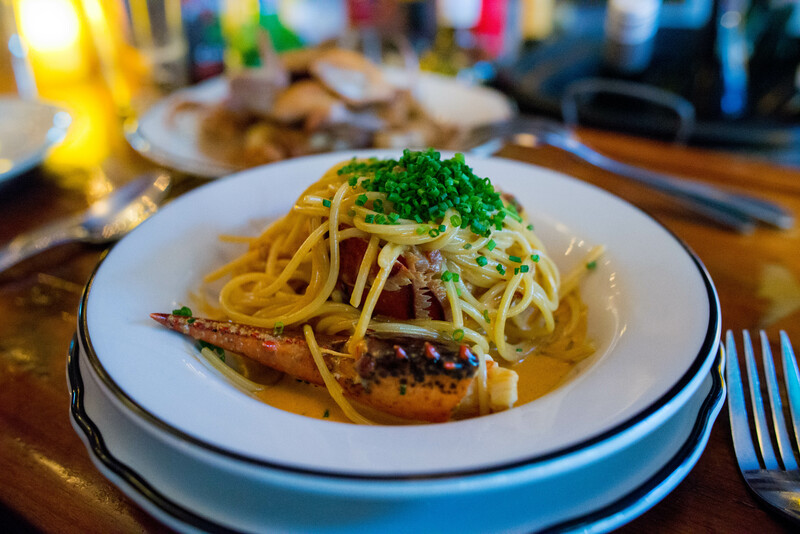 And of course, a bowl of their beautifully simple yet elegant spaghetti with lobster. Is there really anything better than a well executed bowl of pasta? 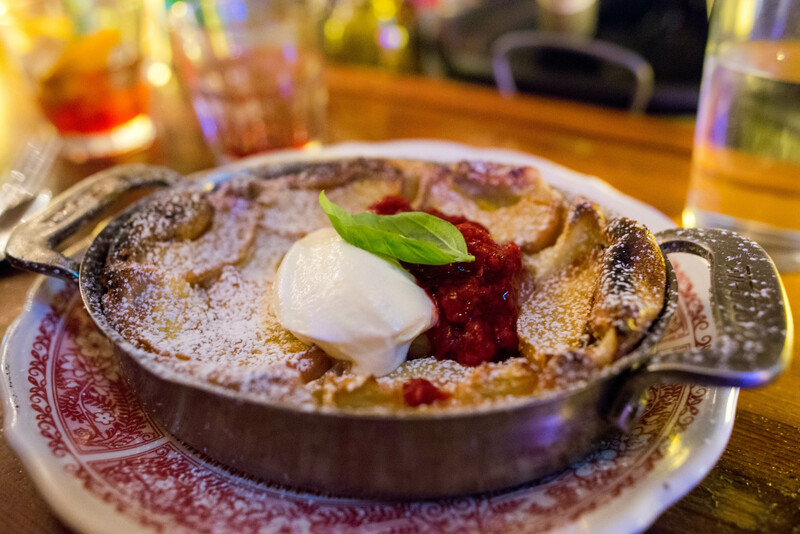 We ended our meal on a sweet note with a not very small pan of clafouti. Topped with just the right dollop of ice cream, this warm and gooey sweet pudding perfectly encapsulated the best of summer fruits. 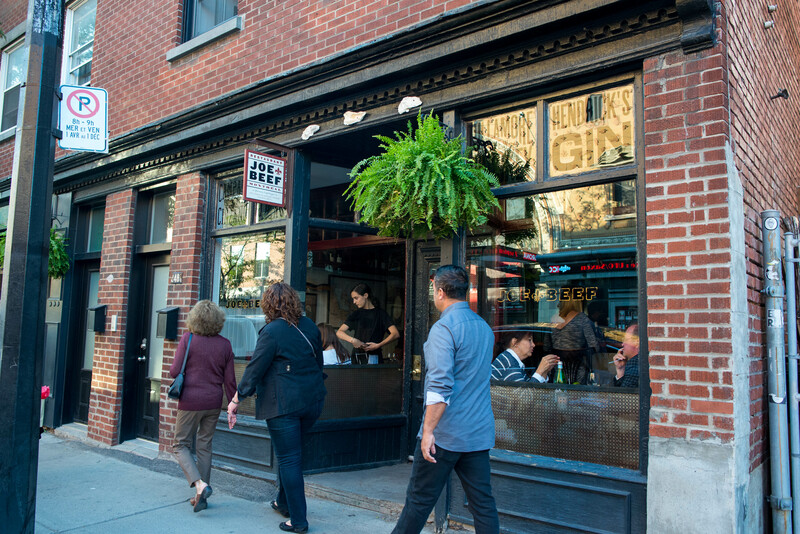 There are so many ways to have a memorable meal at Joe Beef. Even though we weren’t lucky enough to encounter their famous double down foie gras burger on this trip, we absolutely loved every bite of our experience. Just don’t forget to venture into the bathroom before you leave to have your encounter with the buffalo head staring right at you when you walk in.